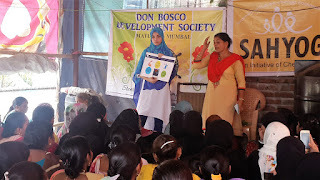 Mumbai, 9th August 2017: The Don Bosco Development Society (DBDS) organized an awareness workshop on ‘Nutrition and Health’ for the women from the slums of Kurla(Mumbai). 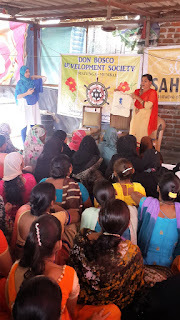 Around 80 women participated in this workshop which beautifully explained to them; how to take proper care of their health and their children too. 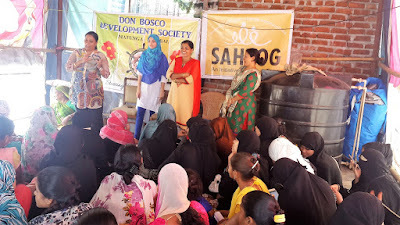 There were three competent resource persons from the organization SAHAYOG Ms. Ruvina (Program Coordinator), Ms Syaima (Nutritionist) and Ms. Nanda (Field officer) who gave detailed information about nutrition and health of women and children. They basically explained different types of nutrition: for strength and for brain. They further explained the types of foods to be consumed and to be avoided – which was a new revelation for all the participants. The workshop concluded with a vote of thanks proposed by Mrs Zarina Khan (Field Staff - DBDS). 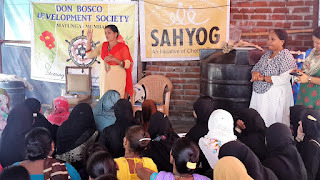 The women participants went back enriched about the information provided and also with a strong conviction to follow – all that was taught to them in the workshop.